Less than a day after the deadly Amtrak crash on the Northeast corridor between Washington and New York, lawmakers on the House Appropriations Committee voted down a proposal that would have increased funding for U.S. rail infrastructure. Proponents of the measure said it would improve rail safety and help prevent crashes like the one that claimed at least seven lives on Tuesday night, but opponents said their hands were tied by a previous spending agreement. The House Appropriations Committee is completing work on its 2016 funding bill, which at this point cuts Amtrak funding from $1.4 billion to $1.13 billion. Many Republicans have long argued that Amtrak should wean itself of public funding, that it needs to figure out how to be self-sustaining. They say that cutting funding would force the railway to innovate. Appropriations Committee Chairman Harold Rogers, R-Kentucky, said Wednesday that the cuts to Amtrak funding were forced by the sequestration spending cuts that were implemented in 2011. "We have no choice but to abide by the law," he said. But Democrats counter that without further infrastructure investment, Amtrak will only continue to fall farther behind rail systems in other parts of the world. New York Rep. Nita Lowey, the top Democrat on the Appropriations Committee, warned that the funding decrease would cut into funds dedicated to transportation safety and infrastructure construction, drastically short-changing "job-creating investments critical to hardworking American families, like roads, bridges, and rail systems." Rep. Chaka Fattah, a Democrat who represents Philadelphia, offered a $1.3 billion amendment to bring Amtrak funding up to the levels requested by President Obama, but it was defeated, 21 to 27, because it defied sequestration limits. "It is deeply troubling that my Republican colleagues defeated an amendment to fully fund Amtrak just hours after this tragic rail crash," Lowey said in a statement. "While we do not yet know the exact cause of yesterday's accident in Philadelphia, we do know that starving Amtrak of funding will inhibit safety upgrades, training, and capital improvements. Our continued failure to invest in road and rail infrastructure is not just unwise - it is plainly a public safety hazard." Lawmakers at a hearing for a House Transportation and Infrastructure subcommittee also weighed in on the crash on Wednesday. 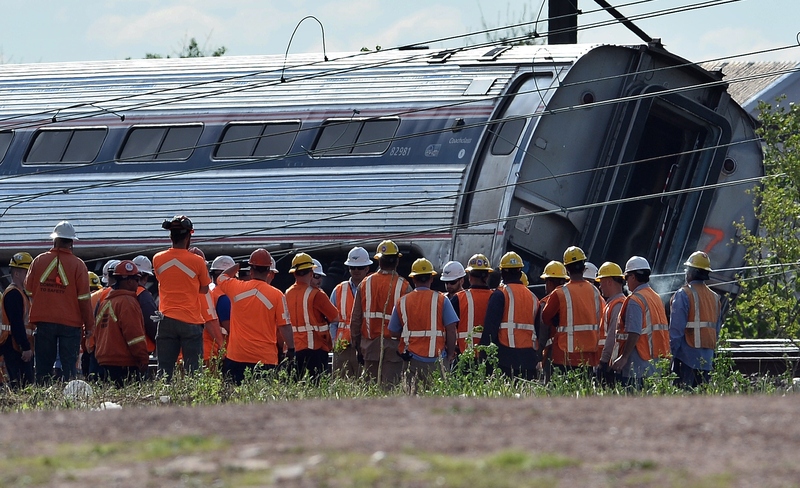 Pennsylvania Rep. Bill Shuster, the Republican chairman of the full infrastructure committee, seemed open to arguments that funding shortfalls contributed to a lack of rail safety. "I've heard some politicians already come out and say if we would have spent more money - maybe that's the case, but it's something I think we really need to take a serious look at," he said. The Northeast corridor, where Tuesday's accident took place, is profitable. But Amtrak uses the profit from the corridor to bolster money-losing long distance train lines in other parts of the country, instead of reinvesting in the Northeast corridor infrastructure. Amtrak CEO Joseph Boardman wants Congress to set up a fund specifically to address crumbling rails and bridges on the corridor, some of which are 100 years old. One New Jersey bridge on the corridor, the Portal Bridge, which carries 450 trains a day between Newark and Penn Station, is 104 years old and needs to be replaced - at a cost of $940 million (in 2013 dollars). Shuster touted a bill he's developed with several of his colleagues that would ensure "profits for the Northeast corridor get put back into the Northeast corridor." "Hundreds of millions of people ride the Northeast corridor, not just Amtrak but all those daily commuters," he said. "It's critical we find out exactly what happened up there and make sure we take the appropriate response to make sure it doesn't happen again." Boardman has also argued that Amtrak needs multi-year funding, and not annual funding. The uncertainty of annual funding makes contracting very difficult. Boardman told Congress in his 2015 budget request, "The uncertainty associated with an annual appropriation sometimes means we are left with excess inventory that must be stored or held until a use can be found for it. It is difficult to get industry [suppliers] to respond to orders or proposals if we can't guarantee large purchases, and it is hard to know when our workforce will be needed, a challenge that is made even harder by the limited work windows that are available on the Northeast Corridor."